In the news: Special Inspector General for Iraq Reconstruction says that 96% of the money from the Development Fund for Iraq cannot be accounted for. This is very different, and probably worse, than saying those funds were ineffective. Based on press releases, the Department of Defense just hasn't a clue where the money went. To further illustrate the situation, see the attached pie chart. No one has ever accused the military of being efficient, but even with the infamous $640 toilet seat we at least knew where the money went. If there's one thing a giant bureaucracy like the D.O.D. should be good at, it's keeping paperwork. Those times seem to have changed since the Bush presidency and Iraq invasion. So where did those 8.7 billion dollars go? As a personal guess, we'll probably find Jimmy Hoffa before those funds are fully accounted for. However, based on the record so far, it's likely that money was eaten up by the fraud, bribery and theft which has plagued reconstruction efforts from the start. How did this problem begin? This isn't the first scandal involving misappropriation of funds in Iraq. Back in 2005, when the Development Fund for Iraq was still young, they had almost exactly the same problem involving another $8.8 billion. Money was spent wildly with little or no record keeping. Large sums of the missing money had gone to private contractors, military and otherwise, and other undisclosed expenses. Fraud and other malfeasance cost the reconstruction at least $13 billion more in 2008 as well. What makes the recent DFI scandal so egregious is that it's not even our money that's being wasted. The Development Fund was built by diverting profits from Iraq's oil and natural gas industry. While the "no blood for oil" slogan is still silly, it doesn't help America's case in world opinion when we make crowds of chanting hippies sound prescient. 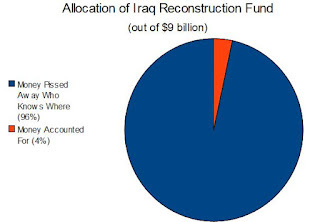 The money missing from Iraq doesn't mean our military is full of crooks; far from it. Instead, these scandals are a lesson in incentives under government bureaucracy. A business interacts directly with customers or investors who provide operating capital, and it must perform to their satisfaction or go out of business. In government, incentives are less clear. The taxpayers will foot the bill no matter what, so the average bureaucrat (or soldier) is accountable only to their superiors. When it comes to the DFI, misuse of funds becomes even more likely because there is another party involved-- the Iraqi people. As another group taking the costs without much say in how development money is spent, it's no surprise that they got the short end of the deal. Private military contractors earn up to ten times an equivalent rank's salary in the U.S. military. Viewed from the ground, the difference between private industry and government must be stark and demoralizing. With soldiers taking the same risks for less pay, the message is loud and clear -- the government is underpaying for your services. The opportunity for rent-seeking becomes too much to ignore. Even high-ranking members of the military were unable to resist the allure of easy cash. It's time for the D.O.D. to make up its mind: either increase military salaries until enough people enlist, or hire an exclusively private military and let the market decide what it's worth to put your life on the line.